Seems like more New Yorkers are opting to board (or bike) with their dog in tow. OK or not OK? We've seen it. You’ve seen it. A skateboarder goes wheeling down the street with a dog on a leash in tow, presumably providing the woofer with some exercise. Ditto cyclists who bring their dogs along for the ride. A poster on Brooklynian notes a perceived uptick in this questionable trend, and blogger F***ed in Park Slope asks, cool or uncool? We fall heavily on the side of uncool, but that’s just us. 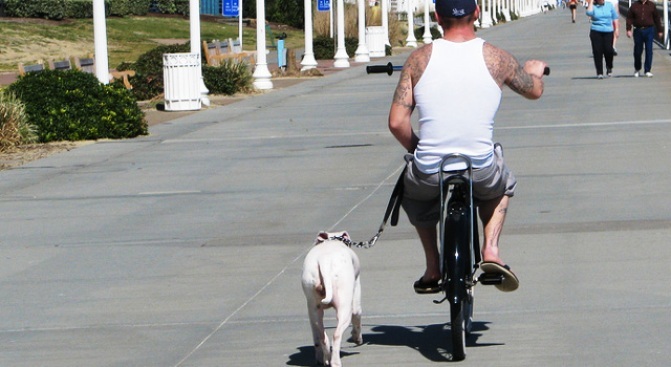 Also, we wonder why we’ve never seen a woman on wheels with a dog in tow – and why the dudes we usually see doing this always wear those Oakley wraparound shades. Head to F***ed in Park Slope for more.